13 February 2018, 09:09 a.m. The latest Global Cloud Index (GCI) 2016-2021 from Cisco focuses on the worldwide market outlook for enterprise data centre virtualization and cloud computing services. Today's digital business is enabled by Hybrid IT infrastructure that supports the deployment of cloud-based solutions. Driven by the surging enthusiasm for digital reinvention projects, data centre traffic is growing fast. 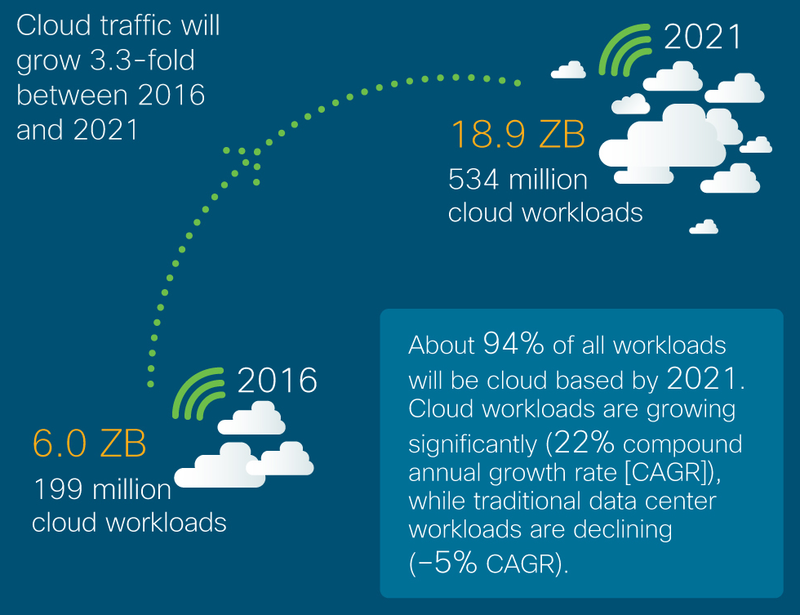 The market study authors forecast global cloud data centre traffic will reach 19.5 zettabytes (ZB) per year by 2021 -- that's up from 6.0 ZB per year in 2016. Globally, cloud data centre traffic will represent 95 percent of total data centre traffic by 2021, compared to 88 percent in 2016. Additionally, according to the Cisco assessment, the growth of Internet of Things (IoT) applications requires scalable server and storage solutions to accommodate new and expanding data centre demands. By 2021, Cisco expects IoT connections to reach 13.7 billion -- that's up from 5.8 billion in 2016. By 2021, 94 percent of workloads and compute instances will be processed by cloud data centres. In contrast, 6 percent will be processed by traditional IT data centres. Globally, the data stored in data centres will nearly quintuple by 2021 to reach 1.3 ZB by 2021, up 4.6-fold (a CAGR of 36 percent) from 286 EB in 2016. Big data will reach 403 exabytes (EB) by 2021, up almost 8-fold from 25 EB in 2016. Big data will represent 30 percent of data stored in data centres by 2021, up from 18 percent in 2016. - By 2021, big data will account for 20 percent (2.5 ZB annual, 209 EB monthly) of traffic within data centres, compared to 12 percent (593 EB annual, 49 EB monthly) in 2016. - By 2021, video streaming will account for 10 percent of traffic within data centres, compared to 9 percent in 2016. - By 2021, video will account for 85 percent of traffic from data centres to end users, compared to 78 percent in 2016. - By 2021, search will account for 20 percent of traffic within data centres by 2021, compared to 28 percent in 2016.